In the 1960s, Lisa Law and thousands of other Americans were moved by the Vietnam War, racial injustice, fear of nuclear annihilation, and the rampant materialism of capitalist society. 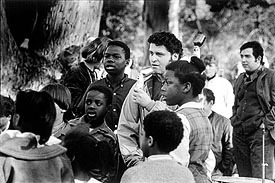 Many were inspired by leaders such as John F. Kennedy and Martin Luther King Jr. Small groups staged sit-ins at schools, local lunch counters, and other public facilities. Masses gathered in the nation's cities to protest what they saw as America's shortcomings. 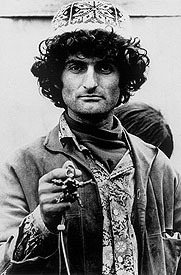 Many members of the counterculture saw their own lives as ways to express political and social beliefs. 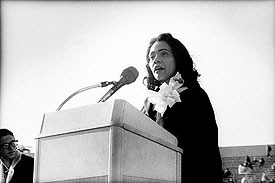 Personal appearance, song lyrics, and the arts were some of the methods used to make both individual and communal statements. Though the specifics of the debates were new, arguments for personal freedom, free speech, and political reform go back to the foundations of American society and the arguments of 19th-century social reformers and founders of new communities. 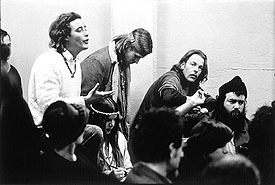 Artist Liberation Front meeting, San Francisco, 1967. This group of artists presented alternatives to "official" art in the form of street fairs that featured live music, mimes, puppet shows, and participatory painting. Victor Maymudes, Bob Dylan's road manager, with a mandala, a symbol of life, Monterey International Pop Festival, 1967. Maymudes carried this mandala made from burnt doll parts to protest the U.S. dropping of napalm in Vietnam. Paul Krassner (center), editor of the underground publication The Realist, and Harvey Kornspan (far right), a member of the Diggers, the Panhandle, San Francisco, 1967. The Diggers were political activists and performers who distributed free food and clothing and staged theatrical events in the streets of San Francisco. 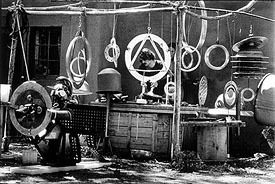 Tony Price playing the atomic gongs, El Rancho, New Mexico, 1970. Price made musical instruments out of materials salvaged from the U.S. atomic bomb research facility at Los Alamos, New Mexico. 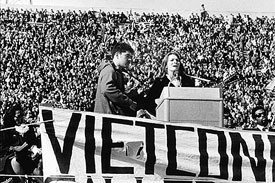 Black Panthers, anti-Vietnam War rally, Kezar Stadium, San Francisco, 1967. 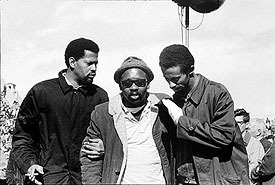 The newly formed Black Panther Party, frustrated with the status quo, called attention to the purportedly disproportionate numbers of black men bearing the burden of combat in the Vietnam War. "General Hershey Bar," San Francisco, 1967. 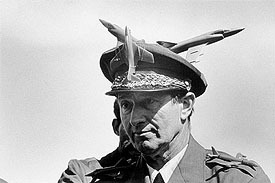 Antiwar demonstrators used street theater and satire to make political commentary. Gen. Lewis B. Hershey headed the Selective Service (Draft Board) in the Vietnam era. 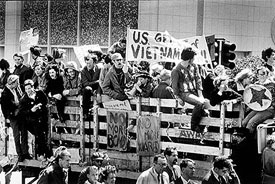 Anti-Vietnam War march, Market Street, San Francisco, 1967.